The biggest problem is getting there, and this is a simple matter of scale. Sailing ships and diesel-powered vessels are a good way to travel Earth's oceans, but the technology is inadequate for distances 100-times greater to get us to the moon in a few days. We need chemical rockets for that. Similarly, another 100-fold step gets us to interplanetary space, and for that chemical rockets are inadequate. We need a completely different technology such as ion rockets powered by solar or nuclear energy. But the biggest step is interstellar space. There, the distance scale factor is over 100,000 times greater than interplanetary distances. We need a propulsion technology that similarly has as much in common with advanced ion engines as the canvas in sailing ships had compared to ion engines. 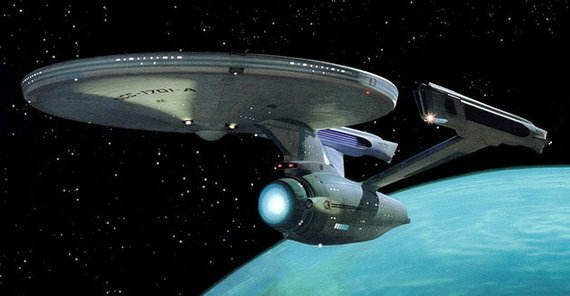 You can forget about 'warp drives' because physicists do not understand what space (e.g. gravity) actually 'is' let alone how to artificially change its geometry. There is actually no physical evidence that it is even a quantum field! Then there is the matter of destination. As I have pointed out in my previous Huffington Post blogs and in the book Interstellar Travel:An astronomer's guide, the cost of interstellar travel is so great we will have thoroughly explored our destination by remote sensing long before we even begin our first flight. For trillion-dollar missions, we will not travel to a star that we do not know IN ADVANCE has a planetary system. But not just any planetary system. To justify the economics and safety risks, it must have an Earth-sized planet in its habitable zone with an oxygen atmosphere, which means a biosphere - which means life! We will simply not make a hundred-year journey only to live under a dome and explore in spacesuits a barren rock with a crushing gravity. Also, we are starting to create a catalog of Earth-sized planets in habitable zones close-by our sun. You can forget all the popular destinations closer than 50 light years like Alpha Centauri, Barnards Star or Epsilon Eridani. And if you want to have an oxygen atmosphere, well we haven't found one of those yet even after looking at planets out to 100 light years or more. Our first interstellar journey will not be a cheap jaunt to Alpha Centauri, but a far more technically demanding expedition beyond 100 light years... or further. We have lots of dreams about this interstellar domain and what we will do when we get there. Science fiction is replete with a bewildering list of possibilities. But the truth of the matter is that these are dreams supported by no known technology that will let us make 100-light-year journeys at the minimum. Although interstellar travel presents challenges far beyond our current level of understanding and technology, interplanetary travel is entirely workable within our existing technological attainments. It is not a matter of technological know-how, but simply political will. By comparison with the interstellar setting, there are comparatively few science fiction stories about interplanetary travel and colonization. Yet, as I discuss in the book Interplanetary Travel: An astronomer's guide, interplanetary travel and colonization are within our technological horizon even today. We have the technology but we as yet do not have the compelling (science fiction) dreams for what to do with it! The biggest challenge is that virtually all of the destinations beyond the orbit of Saturn are ice-bound worlds and moonlets. These provide no useful resources from which to build habitats, unless we go to the extreme expense of building them in the resource-rich inner solar system, and literally dragging them billions of miles to these remote destinations. Having done this, we still require supply ships to bring us replacement parts and food stuffs, although water and breathable atmospheres can be made from locally-abundant ices. Also, it is cheaper to mine a kilogram of ice on a moon of Jupiter than to go all the way out to Pluto to mine the same kilogram. Most of the likely destinations near Jupiter and Saturn are either 'radioactive' and deadly to humans (the four giant Galilean moons), or are poisonous and frigid (Titan). There is a huge curiosity value in seeing them first-hand that any child in grade school can tell you about, but it is pointless to invest in a simplistic tourism industry that would cater only to a vanishingly small fraction of the wealthy population who are also Explorers and in excellent health. Nevertheless, there will be trips to the outer solar system, but these will come about as a byproduct of fast interplanetary travel developed to support activities on Mars, the asteroids and other inner solar system, resource-rich destinations. There will be huge commercial pressures among competing companies to shorten travel times to Mars by advancing new rocket technology at the lowest costs. In terms of rocket technology, it is pretty clear the road that we will take in the next few decades. We will start with solar-electric ion engines that have 10 times the specific impulse of chemical rockets (SI=400 seconds). They will be powered by large deployable photovoltaic films, which will supply the megawatts of power needed to drive spacecraft throughout the inner, sunlight-rich, solar system. 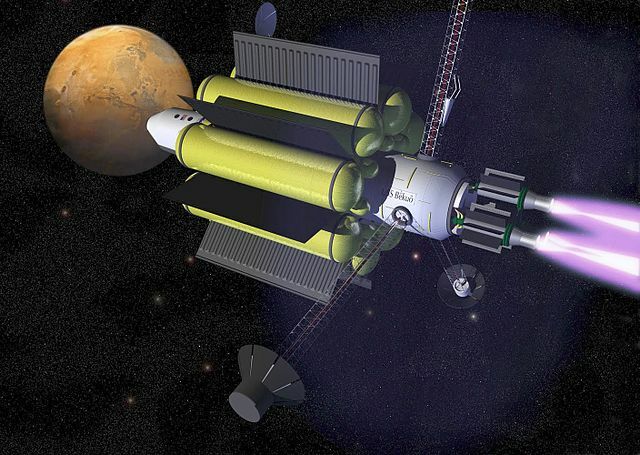 Trips to Mars on the order of weeks or less are easily foreseeable, based on even current ion engine designs. There are no obvious technological roadblocks to developing such engines. Although small kilowatt ion engines have already been used on NASA spacecraft such as Dawn, these provide only an ounce of thrust per engine. VASIMR engines being readied for testing on the International Space Station in the next few years will deliver several pounds of thrust. 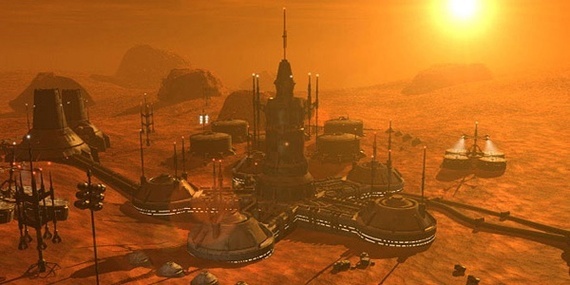 In 2022, a spacecraft now being designed for Mars will test-out high efficiency solar arrays and the newer generation of ion engines operating at far higher thrusts than Dawn or Deep Space 1. It is also expected that the Asteroid Rendezvous Mission in the mid-2020s will test out an even more powerful ion engine. So, we are moving away from chemical rockets and taking the next step to full-scale ion engine technology for most future interplanetary missions through at least 2030. With specific impulses reaching 10,000 seconds or more, nuclear rockets are truly the future workhorses of interplanetary travel and promise journeys to the outer planets taking days or weeks. But current designs are massive, and there is no political will among the Western Democracies for placing them on launch pads. Only China, with its weaker public control of risk-taking might be in a position to deploy nuclear rockets before the middle of this century. This places the realistic horizon for nuclear rockets well into the last half of the 21st century at best. For now, the much safer solar-electric systems will dominate. In fact, they have spin-off technologies that directly impact domestic green energy development! Today, a home owner can cover the roof of their home with solar panels to generate the electricity they need. With the solar technology needed to run ion engines for quick interplanetary travel, such solar panels may only amount to a single square yard of roof surface and a few kilograms of mass! This is how interplanetary travel will be hastened through green energy development on the ground. This is unlike the development program for nuclear rockets, because there are no economic or commercial reasons to build small, low-mass portable nuclear reactors. That niche has been completely occupied by roof-top solar panels and a non-centralized strategy for energy production. The opportunity for making high-speed, interplanetary travel a reality is within our grasp in terms of technology. That is why I am so excited about the prospects for a Mars landing in the 2030s, and where that effort will take us in 2040 and beyond. 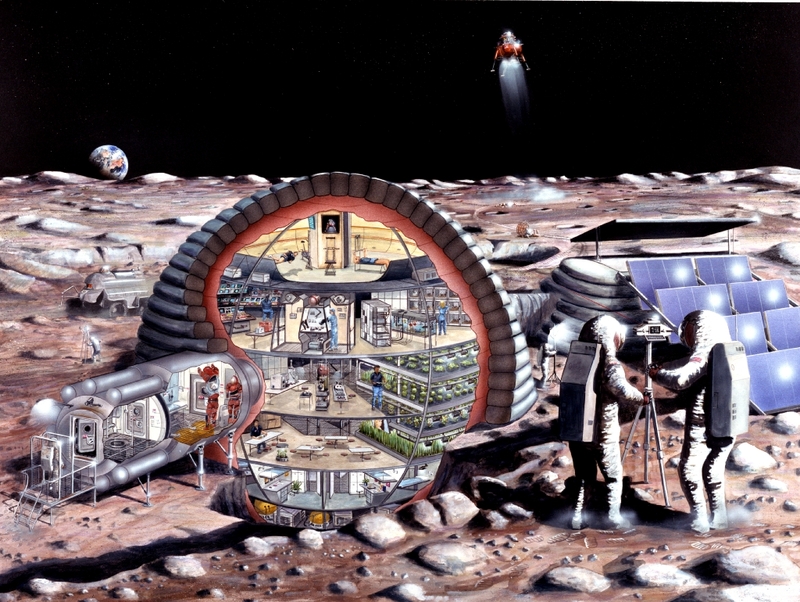 Interplanetary travel will probably never be the family-style jaunt in space that author Robert Heinlein described in his many books, but it will steadily become more of a reality as time goes on. By the 22nd century, it is inconceivable that regularly-scheduled trips to Mars by explorers and scientists will not be commonplace. This may also be the century when some limited commercial tourist travel to the moon and Mars becomes possible as rocket technology advances and travel times become weeks or even days, and not years. From that point on, there will be much that we can do in this solar system in the centuries that follow to erect actual cities on the moon and Mars near water-rich locations, and create human environments that are socially-complex, experientially-rich, and perhaps politically-independent. Meanwhile, let's get started writing more science fiction stories that celebrate the many exciting possibilities within our own solar system and help us dream better! The stars can wait for another millennium.